Acute pancreatitis presenting with normal serum amylase and lipase levels is a rare phenomenon. It is thought that typically, acute inflammation and auto-digestion of the pancreas leads to the release of both amylase and lipase, leading to elevated levels in the blood. For this reason, normal serum amylase and lipase levels in a patient with acute abdominal pain would typically rule out acute pancreatitis in favor of another diagnosis. Here we present two cases of acutely ill patients that were confirmed to have acute pancreatitis radiologically but with serum amylase and lipase levels that remained within the normal range throughout their illnesses for both patients. 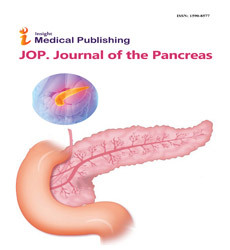 These cases suggest that while an important diagnostic tool, serum amylase and lipase should not be used as the sole factor to either diagnose or rule out acute pancreatitis. Instead, these laboratory markers should be viewed in the context of the patient’s overall presentation, weighted equally with the presenting signs, symptoms, and imaging studies to help guide toward a diagnosis.